Never buy another Tie Rod or Drag Link. This massive system is strong to prevent bending and breaking and if a part is ever worn out or damaged, all you need to do is replace the one piece instead of the entire system. 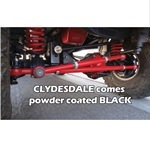 Rein in your steering with our new CLYDESDALE tie rod and drag link. This system is unlike any you have seen before. First the 1 1/4" thread forged end links are massive, especially when compared to ordinary ends. Because of this, be sure to check your current clearance from the center point of your knuckle where the stud goes into the inside edge of your wheel. You need 1 1/2" of clearance to be safe. Next we add thread-in, quick-change cartridges to the end links. 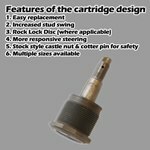 The cartridge design allows for greatly increased stud swing, more than enough for even the most demanding situations. The cartridge features oversized ends with grease slots below the taper. We have different cartridges with different tapers available for various knuckles and pitman arms. 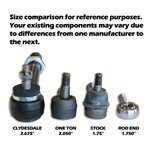 Our tie rod cartridges include the "Rock Lock" disc designed to control rotational movement of the tie rod which is a common problem with stock and other aftermarket tie rods. 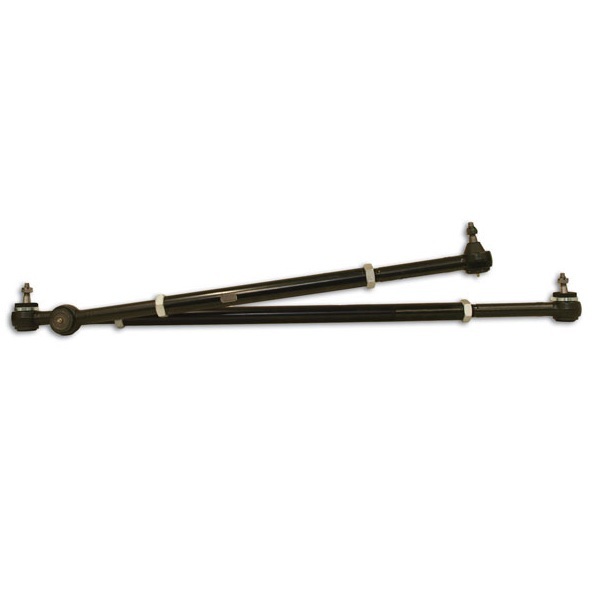 You will never need to replace the whole tie rod again. If the cartridge ever wears out, you can swap in a new one without even needing to get an alignment. 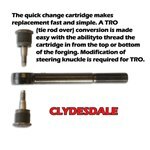 This is also a great feature if you decide to change to different steering knuckles or go to a tie rod over knuckle system. All you need to replace is the cartridge to make it compatible with the new knuckles. The same thing applies to the pitman arm cartridge. If there was ever a need to switch pitman arms to a different size taper, again you would only need to change the cartridge. Finally, the center links are 1 5/8" 4130 DOM stress relieved chromoly. The links have wrench flats machined onto them and use jam nuts for ease of adjustment. 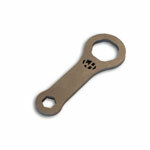 Forgings and center links are powder coated black for great looks and corrosion resistance. * Which Knuckle Style is on your standard width Early Bronco? 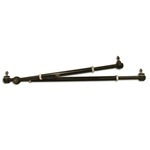 * Which Pitman Arm is installed on your Early Bronco?